This box can be used with a P300 based paradigm to have a simple game. 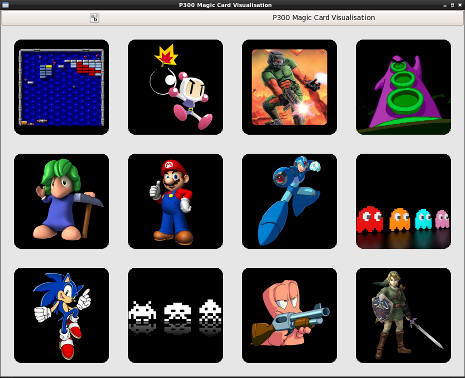 A collection of cards are presented to the user. He chooses one card among all and focuses on this card. 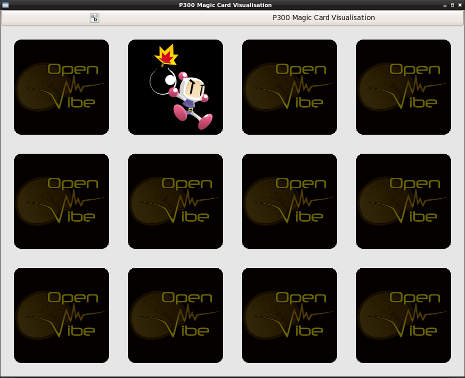 The application shows each card sequentially. After a number of repetitions, the card that the user was focusing on is automatically found. This box has three inputs. The most important one is the first one, sequencing the which card to show to the user. The two other inputs are optional and used for defining the target and the selected card.
) The card display is switched off thanks to the OVTK_StimulationId_VisualStimulationStop stimulation (this is automatically triggered by the P300 Speller Stimulator box). to know what stimulation should be used. The target card will be highlighted with a specific color so the user quickly notices it. to know what stimulation should be used. The selected card will be highlighted with a specific color so the user quickly notices it. This output is used to translate incoming stimulations depending if they are target or not. The actual target is determined with the second input. As soon as the target is known, each flash can be considered as a target flash or not. This can be later use for selecting evoked response potentials against other responses. This is the gtk builder interface to use for the GUI. This color defines the default background. This color defines the background color for target card. This color defines the background color for selected card. This stimulation is used as a basis for the flashes. For example, flashing the first card consists in sending this exact stimulation code to the first input. Flashing the second card needs this stimulation code + 1 and so on. Default background image for every card (the image displayed when the card is NOT flashed). If this setting is empty, the background image for every card must be named "<i>cardname</i>-offscreen" (e.g. "01.png-offscreen"). 1st card. Cards are ordered from left to right, line after line. 2nd card. Cards are ordered from left to right, line after line. 3rd card. Cards are ordered from left to right, line after line. 4th card. Cards are ordered from left to right, line after line. 5th card. Cards are ordered from left to right, line after line. 6th card. Cards are ordered from left to right, line after line. 7th card. Cards are ordered from left to right, line after line. 8th card. Cards are ordered from left to right, line after line. 9th card. Cards are ordered from left to right, line after line. 10th card. Cards are ordered from left to right, line after line. 11th card. Cards are ordered from left to right, line after line. 12th card. Cards are ordered from left to right, line after line. This box is used in the P300 magic card BCI. Please see this scenario in the sample openvibe-scenarios.